Jang Song Thaek was stripped naked, thrown in a cage and mauled by 120 hunting dogs that had been starved for five days, according to a report in a Hong Kong newspaper. Kim Jong Un and 300 officials reportedly watched the gruesome hour-long horror show. Kim Jong Un is Korean Idi Amin! Positively horrible and shows how crazy Kim Jong Un is and proves how strange and brutal North Korea is. Thanks Marty. The man is absolutely nuts! Thanks for sharing. OMG! This can't be true... I've never heard of anything so horrifically brutal! How could someone even come up with anything so barbaric, not to mention subjecting a family member to it. This made me absolutely sick! This is very scary! This is one scary and nutcase dude. The North Korean government has no problem with trying to pass off absurd claims as fact. They did claim that Kim Jong-il being able to control the weather based on his moods , that he was walking around and talking to people at just six months of age and he did bump off his older brother when he was six. His son tossing his uncle and five others to a pack of starving dogs sounds almost tame in comparison to some of the previous claims made by the regime. 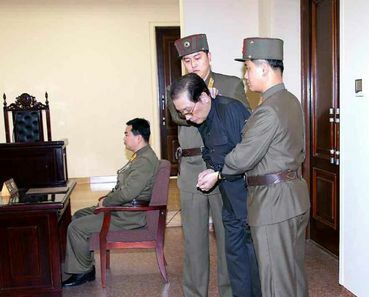 Given there is also claims Kim Jong Un had a North Korean military officer executed with a mortar shell blast for disrespecting late 'Dear Leader' Kim Jong-il by drinking alcohol during the 100-day mourning period. There is either an indication that he is a nasty piece of work or he is a Caligula nut job so expect him to be dead in a couple of years. I think nutcase and nasty piece of work covers a lot. I can see it being true as well as making people watch it. People can be completely screwed up. pretty darn scary and sickening. Can you picture it... watch the people watching the horrific scene you set up.. if they twitch you 'punish' them also. This is Horrible but that's the kind of country they have! He is Nut's! Well, this rotten apple certainly didn't fall far from the tree! You have to consider who his dad was, and how crazy he was during his reign of terror. I just feel sorry for the North Korean people having to endure another reign of terror, for possibly some decades to come. Remind me not to visit North Korea...nasty. "There was no way to confirm the horrific details of the super villain-style execution". However, not much would surprise me when it comes to dictatorial leaders of his ilk. I read this article a few days ago. I really didn't (still don't) know what to make of it. I wonder who the real monsters are? The living? The dead? The handlers of the starving dogs? It's some scary sh*t!! something sick in that boys genes. It would not surprise me if this article is true this is a rouge nation governed by a cabal of despots and psychotic murderers.